Firstly CONGRATS to my dear cousin kristie (and her hubby James) who gave birth to a baby boy on 1 Aug. Can't wait for her to upload photos of that little prince. :) Really happy for you guys! Well lots of people around me have been either getting married(one of my besties got married in June, another one later in Dec and the ex BF in Nov), getting pregnant(one poly friend and my colleague at work 4 and 3 months respectively) or giving birth(my cousin) to cute little babies this year and man it sure makes you feel like you should be getting on to that next phase as well. But then again things don't usually work a certain way, it doesn't mean that you MUST settle down and have babies at a certain time because it's the right; there's no point if the feeling and timing isn't right. I remember when I was back in SG in Feb, I went out with a best girl pal and she was single and happy and she said she was sick of all her other friends having talking about applying for houses to get married etc. and funnily in a certain way, I think I would have felt the same. I mean don't get me wrong, I am happy for the people who are getting married, pregnant and having babies, but I guess it's just not the right time for Tubbs and me yet, at least not in a year or so and it's pretty annoying when people ask me when it's our turn to get hitched and stuff. Come on, we pretty much just started working and settling down in Melbourne not long and we would prefer to enjoy the life of just the two of us (& Jasper) for the moment and going on to the next phase seems too soon because usually after marriages means pregnancy and huge responsibilities and I guess we are just not ready to go into that yet. 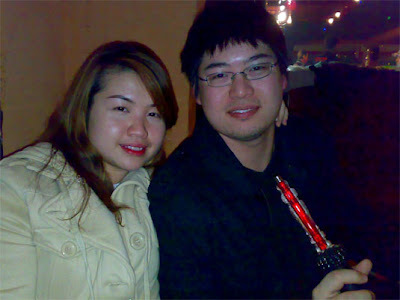 Childish or not, for the moment we're enjoying the outings, buying new gadgets and going for trips etc. I think we will be ready when the time is right and when the finances are more stable. 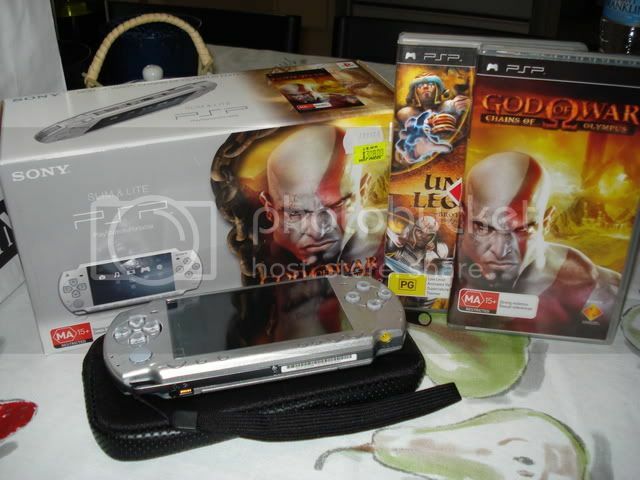 God of War PSP Bundle: $299 from JB Hifi Mid Year Sale! I have decided(unlike the Nintendo DS) I'm not going into the "dark side", meaning I'm not gonna play bootleg games on my PSP because you can't do system updates once you go the direction of using the loaded to load the Pirated ISO game files. Not that the system updates really matter that much, but just cause I prefer going out to look for games to buy and bring them home and also because the ISO files are super big - like 500MB to 1-2GB for each game, so downloads wil be pretty heavy on Internet quota too. Anyway I'ma loving my PSP; wireless Internet browsing, storing music, photos and videos all in one, plus there's even Skype on it! So it's just awesome! A ShiSha or hookah (Hindi: हुक़्क़ा, Urdu: حقّہ, hukkah) is a single or multi-stemmed (often glass-based) water pipe for smoking. 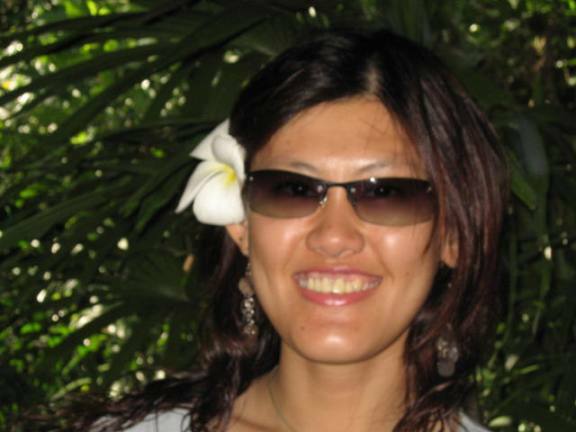 Originating in India, it has gained popularity, especially in the Arab World. 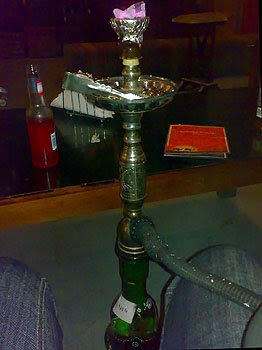 A hookah operates by water filtration and indirect heat. It can be used for smoking herbal fruits. Source: Wikipedia. We did a GPRS search and found the Sahara Cafe along Lygon Street in East Brunswick. Mind you the place looked a bit dodgy and it was $10 per entry (for the so-called Belly dancers) which we didn't get to see because we didn't stay late as the people there seemed to be getting more rowdy as the night went by. There were flavours like strawberry, apple, banana and a couple more I can't remember. We chose the Apple one and darling said it wasn't as harmful as a cigeratte and so he thought (I found it to be otherwise when I googled it the next day!). But anyway it was just an experience and I don't think I'll do it again because I couldn't stand the strong smell and somehow there is a scratchy feeling down your throat when you inhale it in. I was feeling and looking super sleepy cause the smoke was really hitting in and darling was saying it's been a long time since we've been in a sort of "clubbing-like" atmosphere, which made me think about the clubbing days we had with my chabohs. 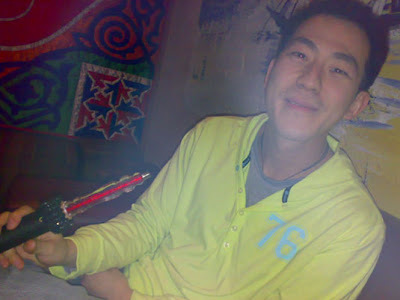 Wangwei in the next pic trying to pose and show the smoke coming out from the pipe. *boliao* haha..
Other than that, life's pretty much the same(still learning new things everyday on the job and more courses up later part of the year), though darling and I wanted to go watch Wicked -The Musical, but tickets for the Emerald class are all sold out from now till Sep, so hard luck I suppose since we didn't think of booking earlier. Alright gotta go now, we are so lazy we are actually going on google to find a restaurant we can order food online and have it delivered to us!